Last month, Club Pilsner through its brand manager Mr. Robert Nsibirwa, while addressing some of the visitors and journalists at NBL Service center in Luzira announced and revealed that Club Pilsner will be injecting at least 300,000 US dollars in the upcoming Major Lazer show slated to take place in Kampala on 8th October 2018 at Kampala Sheraton gardens starting 6 pm featuring America’s top trio and top singers in the country like Fik Fameika, Beenie Gunter among others. Club Pilsner confirmed the show is happening on 8 October. But the big question remains, what does Major lazer stand for? First of all Major Lazer is a leading American electronic Dance music trio with several hit songs registered on their name which includes Pon de floor featuring Jamaica’s Vybz Kartel released in 2009, watch for this (Bumaye) released in 2013 featuring Busy Signal, The Flexucans, and FS Green, Be together featuring Wild Belle released in 2015, Jah No partial featuring Pavillion in 2013, Hold the line featuring Mr. Lexx and Santigold in 2009, Light it up featuring Nyla and Fuse ODG in 2015,Powerful featuring Tarrus Riley and Ellie Goulding, Lean on featuring DJ Snake and MO, Run Up featuring Nicki Minaj and Ty Dollar Sign, and Cold water featuring Justine Bieber among several other hit songs. Why it is a must attend for you? Several international acts have graced stages in Kampala the past years and Ugandans took them for granted. Artistes like Chris Martins, Busy Signal and others have come here but whoever attended unfortunately said that they are the same people like Ugandans; it’s hard for me to believe that Major Lazer will be a disappointment to Ugandans. I have a few reasons why you should and must attend in person. 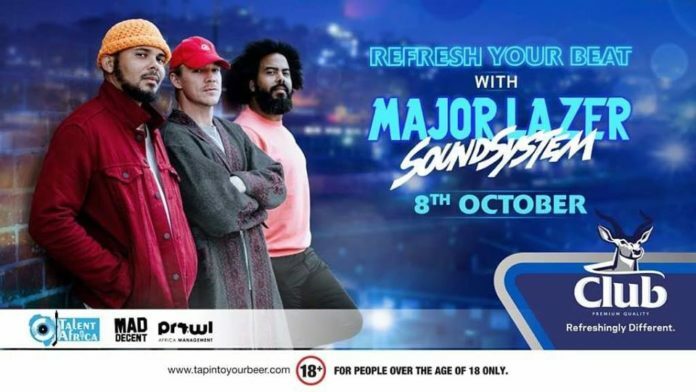 Major lazer has released tens of super hit songs which have rocked the airwaves for the past years featuring world’s biggest names like Justine Bieber, Sean Paul, Amber, Nicki Minaj, MO, DJ Snake among several others. The sound and organization at their shows is unimaginable. 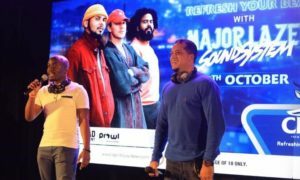 Unlike many other artistes who lacks good sound engineers, MajorLazer members are sound engineers themselves and therefore they cannot fail to do the good for themselves. The Major Lazer show will happen on the 8th October 2018 at Kampala Sheraton gardens proudly sponsored by Club pilsner, Talent Africa and tickets will go for 40,000 shillings and 120,000 shillings. Come we celebrate the independence together at Kampala Sheraton gardens with the biggest trio in the world.